Caleb is a programmer working for Bluebook, the world's most popular search engine. He is chosen to visit the company's eccentric CEO, Nathan, at his secluded research facility in the mountains. The only other person there is Kyoko, a young housemaid. Nathan reveals he has been working on artificial intelligence and wants Caleb to administer the Turing test to a humanoid robot with artificial intelligence (AI) named Ava. I love science fiction - movies and books - so try to watch any new offerings that come out. 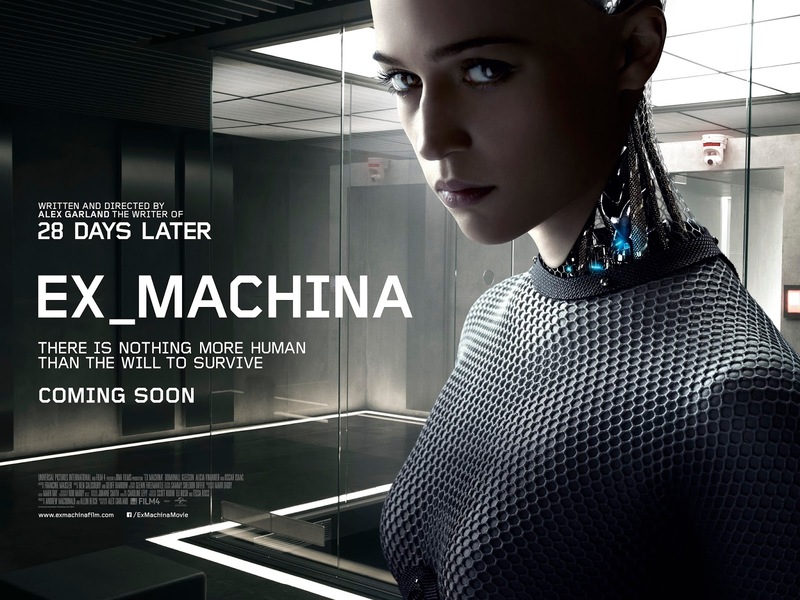 Ex Machina was a no brainer. Under genre it is listed as - Drama, Mystery & Suspense and Science Fiction & Fantasy, but definitely the lasts holds the most true. I first and foremost want to give accolades to Alex Garland as I think it's the script and directing that make this film truly stand out. Well done. The choice of set (both studio created and at the beautiful Juvet Landscape Hotel in Valldalen, Norway), the filming of the scenes and the pacing of the interactions between the different characters kept me engaged. I loved that it had a slower pacing than today's usual movie offerings. Garland used dialog and interactions to draw the plot along to it's ultimate resolution. There are no prolonged, violent fight scenes, no car chases, no giant explosions - just great concept, script and directing. There are three main characters in this movie. Caleb Smith is played by Domhnall Gleeson. He is a computer programmer who supposedly wins a company wide contest and is whisked off to the CEO's very remote mansion/lab. The strange and odd CEO - Nathan Bateman - is played by Oscar Isaac. Of the three, this is the character that just didn't mesh for me. Too out there and not quite believable in his interactions with Caleb. Lastly is the robot Ava, played by Alicia Vikander. I loved the Computer Generated Image (CGI) body they created for her, the way she used lack of facial expression and movement to create the character and the slow transition to covering the robot body to let her look more and more human. The plot moves along quietly - something that really works because of the strong dialogue the script offers - and builds steadily at just the right pace.. I found it interesting that none of the actors really stood out on their own. Their characters were an intricate part of the script that folded beautifully into the plot. It was always a blend with no ingredients popping individually. I think all movies are best seen without too much information ahead of time, so I don't want to share any more of the plot. I encourage you to watch this movie without expectation. If you only like action movies, this isn't for you. If you enjoy a movie with more depth and thought behind it, I think you'll find this a must see. Alex Garland's journey to creating this movie is interesting - so I would like to offer this excerpt from Wikipedia in closing, along with 2 movie trailers. "The foundation for Ex Machina was laid when Garland was 11 or 12 years old, after he had done some basic coding and experimentation on a computer his parents had bought him and which he sometimes felt had a mind of its own. His later ideas came from years of discussions he had been having with a friend with an expertise in neuroscience, who claimed machines could never become sentient. Trying to find an answer on his own, he started reading relevant books about the topic. During the pre-production of Dredd, while going through a book by Murray Shanahan about consciousness and embodiment, Garland had an "epiphany". The idea was written down and put aside till later."